‘James Connolly: Life & Legacy’ at the Dublin Writers Festival | Come Here To Me! But times, we are told, have changed. We must live in the present; not in the past. That of course, is right – unquestionably so, but my contention is that the changes that we see in the political situation since Connolly’s day are very superficial changes. 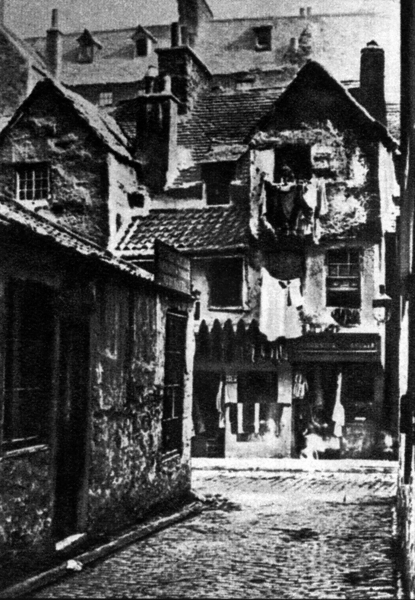 The Cowgate slums of Edinburgh, home to James Connolly in his youth. Writing in 1898 in the pages of The Workers Republic newspaper, James Connolly outlined his belief that “apostles of freedom are ever idolised when dead, but crucified when living.” The centenary of the Easter Rising being upon us, the men and women of that April week remain idolised, but in many cases stripped of their complexities and character. James Connolly in particular, who left a great collection of work behind him, is a figure who has suffered greatly in the watering down of Ireland’s revolutionary past. The upcoming Dublin Writers Festival contains many interesting talks and discussions, but one that caught my eye is titled ‘James Connolly: Life & Legacy’. It contains an interesting panel, with Lorcan Collins, Catherine Morris and Richard Boyd Barrett attending. 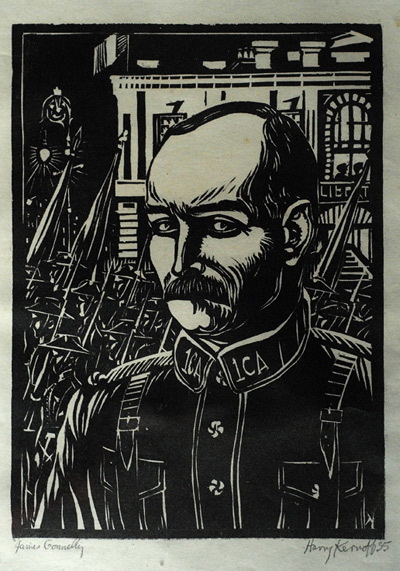 Harry Kernoff’s fantastic woodcut of James Connolly. Lorcan Collins is the author of the most recent biography of Connolly, which is part of the ’16 Lives’ series he is co-editing. It’s mindblowing how many of the sixteen executed leaders do not have biographies to date, and men such as Sean Heuston and Michael Mallin have gone largely unexplored until now. Collins’ biography however is the latest in a long series on Connolly, but remarkably fresh and enjoyably written, and very much in an accessible spirit, bringing Connolly the man to life, ranging from Connolly as a loving father to his failed venture in the form of his Edinburgh cobblers’ shop. Lorcan runs the hugely popular 1916 Rebellion Walking Tour in Dublin, which we have featured on the site before. Richard Boyd Barrett is a TD with the United Left Alliance, and has been active in a wide variety of recent campaigns, including the Campaign Against the Household and Water Charges. The centenary of the Labour Party brought criticisms from many on the left that Labour today was “a hundred years and a million miles” removed from Connolly politically, and Boyd Barrett’s contributions should be interesting. Catherine Morris is a great addition to this line up in my opinion, and I’ve really enjoyed her recent work on Alice Milligan, and her tireless drive to bring some attention to a woman history has somehow forgot. Milligan was a feminist, journalist, and activist who came from a northern Protestant Unionist background yet became a leading Irish nationalist writer in her day. She was active within the language revival movement and moved in the cultural and political circles of Irish nationalism in the late 19th and early 20th centuries, editing publications such as the Shan van Vocht newspaper. Just how such a remarkable contemporary of Connolly’s has passed into obscurity is baffling to me, and Morris’ recent study of Milligan entitled Alice Milligan and The Cultural Revival is a really welcome addition to the historiography of the period. It should certainly make for a great discussion. It’s set to take place in the National Library on the fifth of June, and all information is below. Thanks for this, will attend. Currently reading Connolly’s works and am constantly reminded of the parallels of early twentieth century struggles with the situation in Ireland today. Connolly was certainly aware of the wider international context of capitalism and its effects on a peripheral and colonial Ireland. He correctly identified the particular brand of comprador capitalism apparent in turn of the century Ireland, in which local elites viewed their interests as tied with the British metropole, rather than their impoverished compatriots. Eamonn Gilmore’s ‘vision’ “to restore Ireland’s reputation as a good and stable place in which to invest and do business” at Connolly’s graveside is both myopic and completely disrespectful of his legacy. It amazes me that Labour continually seeks historical lineage through blatant co-option of figures that in current terms stand in complete opposition to the practical import of their political stance today. It is certainly true that ‘labour must wait’, it has been since 1918.